In the previous articles we read about two similar versions of abhicara. Finally, before we conclude, here is another interesting and many feel a better known version of abhicara in Malayalam versions of Mahabharat. According to this version, a sage by the name of Kaala MaMuni, an expert in rituals arrives at the court of Duryodhan, at his behest. Here the Dushta Chathushtaya (Duryodhana, Duhshasana, Sakuni, Karna), the evil-foursome, urge the sage to perform the abhicara to rid Duryodhan of the Pandavs. The sage is worried that he is being asked to do something that would rid him of all his good deeds accumulated over the last seven births. He tries to reason with the foursome, but they continue to praise him, till he gives in. All this was being observed by Yama and as the beholder of dharma, he decided to do something. Soon a Brahmin boy’s deer-skin was taken away by a deer. He urged the Pandavs to get it back from him and so the Pandavs set out chasing the deer. The deer chase was a never-ending one, and soon the Pandavs got tired and arrived near a pond, which however was poisoned. Yudhishtir asked Sahadev to go and fetch water for all. Sahadev died on the spot after drinking the water and soon Nakul, Arjun and Bhim were casualties too. However, Bhim managed to write on the ground that the water was poisoned. By then Yudhishtir was too tired and fainted for want of water. While this episode seems to have borrowed from the popular episode of Yaksha-parva from the original, it sure has its own elements of abhicara, weaved in quite effectively. It is interesting to see how regional beliefs have crept in the retellings of the epic. Every version has an element of localisation and the Malayalam versions are no different. What is interesting is that the retellings have been further made popular in the different dance forms which are regularly enacted, it hasn’t been lost. The rich and thriving art forms which had the sanctity of temple premises have not given way to popular dance forms and are regularly performed even today. This speaks volumes of the desire to save the art forms from dying, while keeping the old and ancient texts alive, even in difference with the original Sanskrit version. Besides regional flavours, it also throws light on the social structure of the day. While we have read that the rituals are performed by the aboriginal tribes of today, it shows that in a period when caste-system was very strong in other parts of the country, the people of this region did not stop the people from the marginalised sections of the society from entering the temple. Not only did they enter the temples, they even performed some of the rituals and have divinity attached to the origins of the community (as seen in Lord Shiva being the first Velan). Once again, my sincere thanks to both Mr. A. Purushothaman and Mr. A. Harindranath for sharing their knowledge on the subject with me and simplifying my learning to a large extent, something on which they have been working for years. In the previous part, we read about the Pallippana ritual and the legend behind it. Today, we will read a slightly different version of the same, where the ritual is not conducted by the Malayi. A slightly different version from the above is observed in the Nizhalkkuttu attakatha which was composed by Shri Pannisseri Nanupillai in 1925, and according to the author, there weren’t too many Hindu homes (then) which did not perform the Nizhalkkuttu attakatha at least once a month to annul the effects of abhicara which could have been performed by some unknown person. The story behind this is similar to the above with a slight difference. Duryodhan calls Bharata Malayan to perform abhicara. When Malayan learns that the victims of his act were going to be the Pandavs, he declines to do it, as for him both the Pandavs and the Kauravs were Kings, besides the fact that Krishna was with them, due to which he would not be able to do so. Duryodhan threatened him with dire consequences if he did not comply with his order. Malayan agreed but asked for certain things for the ritual – the sun as a lamp, the moon as a plate, measures of darkness, egg of an elephant, arrows used by Lord Rama, some leaves made of water, etc. Besides all such impossible things, he also asked for the sacrifice of their sister, Dusshala. On hearing all this Duryodhan was enraged and threatened to kill him instantly, if he did not begin the abhicara. A reluctant and a scared Malayan decided to perform the ritual. When the ritual began, Malayan realised that he was unable to see the shadows of the Pandavs on the stone. He was worried, if the ritual was not successful, Duryodhan would kill him. He prayed to the gods to bail him out of the plight. Soon he noticed that he could see the shadows of the Pandavs along with that of Lord Krishna. He prayed to Krishna to show mercy on him as he was doing this only under utter duress. Soon the shadow of Krishna went missing and his task was accomplished. He begged forgiveness and left with all the gifts heaped on him by Duryodhan. When he reached home, his wife found it unusual that he should return with so many gifts, and still be sad. On asking him the cause of his unhappiness, Malayan said that on his way back he practiced abhicara on five does, who were with a deer. Malayi was not convinced and on insisting to know the truth, Malayan told her that he had killed the Pandavs by Nizhalkkuttu, shadow-piercing. When Malayi learnt this, she was enraged. She killed her son, so that Malayan could feel the pain of Kunti and rushed to the spot where the Pandavs were lying dead. In the meanwhile Kunti finds her dead sons and calls for Krishna. Krishna revives them and soon Malayi arrives there and tells all that had happened due to her husband. Krishna assured her that he knew everything and killing her own son was too drastic a reaction and that his son would be alive too and that there would be no hatred towards Malayan as he had done it out of sheer compulsion. Krishna then goes on to say, that anybody who listens to this tale would never be affected by abhicara ever. The above version is different in the fact that here Krishna is credited with the revival of the Pandavs and not Malayi as in the previous version. Also, Malayan is shown making efforts to avoid the abhicara and thus he is not spited for greed, again, as against the previous version. Also, in the earlier version, the son remains dead, unlike this version, where the son is given another lease of life. The bottom line is that in the previous version the Malayi is at the centre stage whereas in the present, it is Lord Krishna. 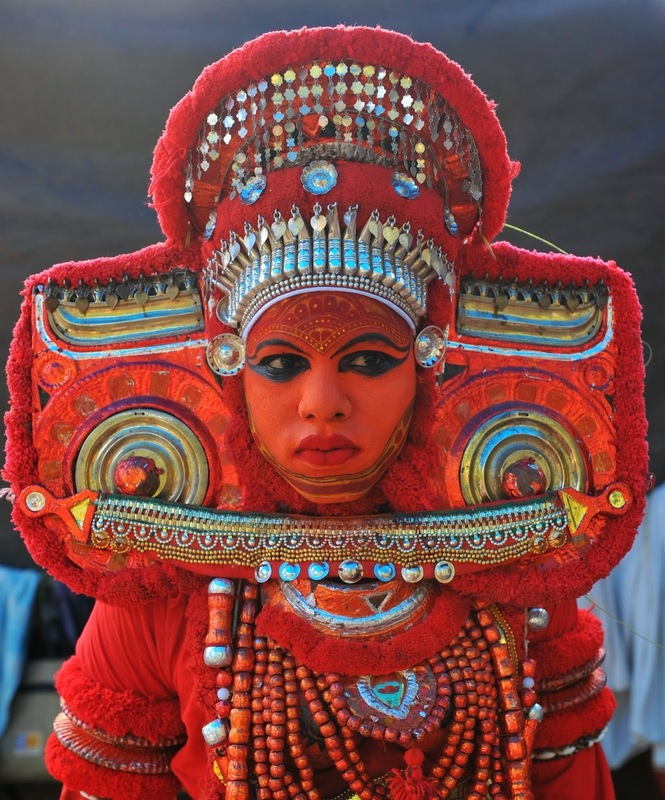 Needless to say, that both the versions are depicted in different dance forms in Kerala, like Theyyam and Kathakali, and people who have witnessed the performances say that the depictions of the abhicara episode in Kathakali is extremely colourful and rich in details. NB – The pictures shown in this and the previous article are not from a ritualistic performance, but stage performances of Kathakali, depicting the episode. In this Blog, you have read about different versions of sometimes the same tale, myth, etc. Earlier, we have read about different versions of the epic Ramayan (http://www.utkarshspeak.blogspot.in/2011/12/part-1-ramayanas-from-south-india.html, http://www.utkarshspeak.blogspot.in/2011/12/part-2-ramayana-from-jain-texts.html, http://www.utkarshspeak.blogspot.in/search/label/Ramkien, http://www.utkarshspeak.blogspot.in/2011/12/part-4-ramayana-tribal-version.html). In bits and pieces, we have also read about different episodes of Mahabharat, which have been from different versions, especially regional versions of the Mahabharat. It is interesting to note how regional aspects, like identity, behavioural and moral codes have shaped the narrative and even created new heroes or focussed on unsung heroes from the original text of Vyasa. Mahabharata in Kerala too has its regional version and some aspects are a far cry from the original. What is interesting is that some of the episodes are part of the present day enactment in a number of dance forms of Kerala like the Kathakali, Theyyam, etc. While, I must add that the entire version is worth reading as it is extremely colourful and interesting, we will focus on only one aspect of the difference from the original text by Vyasa, and that is the act of Nilalkkuttu or shadow-piercing by abhicara, i.e. use of black magic. At the onset, let me thank both Mr. A. Purushothaman and Mr. A. Harindranath, who have been studying this aspect very closely, for sharing details with me on the subject as well as allowing me to use photographs from their personal collection. While there are different versions of abhicara in different versions of the Malayalam Mahabharat, we will only discuss a couple of them, which are till date enacted in different dance forms across the state, besides being a part of certain rituals in some temples in Kerala. While there are some common elements amongst the different versions, the difference does make interesting reading. It is important to mention here that the rituals that are performed as part of the ritual enactment of the myths from the epic, are generally enacted by Malayas, Velas, Mavilas, Koppalas, and Pulayas, etc. who are part of the aboriginal groups of Kerala and the adjoining regions. At the Ambalapuzha Srikrishnaswamy Temple, a ritual called Panthrandu Kalabham is performed during 1st to 12th of the Malayalam month of Makaram (December - January) every year. After every 12 years, the ritual called Pallippana (palli is divine and pana is song; Pallippana is divine song) is performed at the temple. The ritual of Pallippana consists of two main rituals, Oattu, performed by the Velans during the day and Muroattu, which is performed by the Velathis during the night. We will not go into the details of the ritual enactment, but will focus on the legends behind the rituals. One of the legends says that the Pallippana was first performed by Lord Shiva. Once due to excessive work pressure, Lord Vishnu fell unconscious. Subramanya, the god of Astrology, suggested that Pallippana be performed to revive and rejuvenate Vishnu and same had to be done by a Velan. The world was searched for a Velan but none could be found. It was then that Lord Shiva took the form of a Velan and Parvathi as the Velathi and performed the first Pallippana and revived Lord Vishnu. Bharata Malayi a servant of the Pandavas was worried that her husband, Bharata Malayan was gone for too long and had not returned home. She decides to step out along with her son to look for her husband. On the way, she sees him coming with a large bundle which was full of gifts. When Malayi enquired about the gifts, he said that he had got the gifts from his masters (Kauravas) who had got together with her masters (Pandavas) for a hunt. Malayi not satisfied with the answer, further inquired if there was any death in the ritual, to which he replied that five stags and two deer were killed. Malayi immediately understood that her husband had shadow-pierced the five Pandavs along with Kunti and Draupadi. She was angry with him as he had earlier pledged to her that he would never harm the Pandavs, her masters and she to his masters and this pledge was broken by Malayan. Malayi insists on doing the counter abhicara to revive her masters. Malayan tried to dissuade her by showing her a diamond necklace which he had received as a gift. An angry Malayi threw it away. Their son also tried to dissuade her, which further infuriated Malayi, as she felt that the son was like the father. She killed their son in anger. She then recited the counter- abhicara mantras and invoked the gods. The gods appeared and asked her what she wanted. Malayi asked for all those things that she needed to perform Pallippana, which were none other than the ones that Lord Shiva had used to perform the first Pallippana. The gods were pleased with her and gave her all the items that she had asked for, with the help of which Malayi revived the Pandavas and Draupadi and Kunti. It is interesting to note that the entire performance is conducted by an aboriginal group and the main act is performed by the women. Here the woman is serving the righteous and also revives them when they were wrongfully killed by her husband in return for material gifts. She doesn’t even think twice before killing her own son, for taking the side of the wrong/evil. The first performance of the ritual having been done by Lord Shiva, lends a sense of credence and divinity to the later and modern day performers, even if they are an aboriginal group and probably marginalised in the modern times. The Panthrandu Kalabham is performed every year to rid the idol of impurities and weakening of its powers with time and sometimes due to the rituals not performed in accordance to the laid down norms. A deity which is not powerful cannot shower effective blessings and such rituals enable the deity to regain its diminished or lost power.